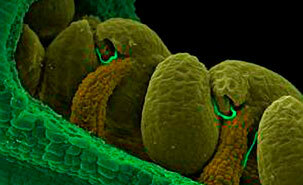 Inside of the pistil of an Arabidopsis flower revealing the ovules being fertilized by pollen tubes (thin green lines). Credit: University of Montreal. Microsystems technology was required to undertake this experiment due to the tiny size of pollen tubes and the consequently minute amount of force they exert to accomplish penetration. The pollen tube requires not only an invasive force to overcome the mechanical resistance of the surrounding tissue, but also the protection of the contents that is to be transported, the sperm cells, of which there are exactly two in each tube. It is crucial that the pollen tube remains tubular while winding its way through the pistil, since kinks and collapses of this catheter-like organ prevent the passage of the sperm cells, similar to a blockage in a twisted garden hose. A typical pollen tube can become many centimeters long but is only between 5 and 20 micrometres wide. By way of comparison, a human hair is typically 100 micrometres thick. “To fit the dimensions of this cell, we had to design the microchip with microscopic channels and obstacles that are narrower than the pollen tubes. We used high resolution soft and direct write lithography techniques to produce this micron-sized obstacle course. 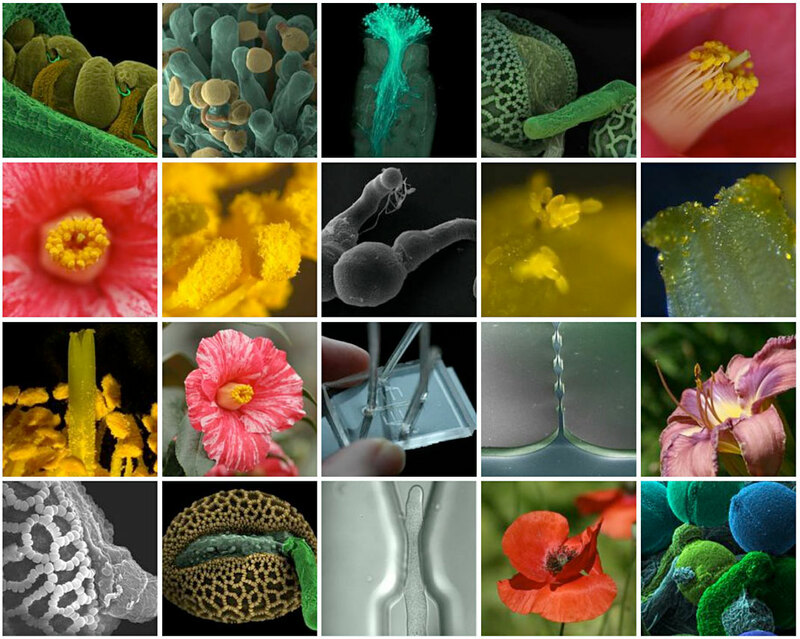 Furthermore, measuring the pressure that pollen tubes exert requires materials that are just the right consistency – not too hard and not too soft. We chose an elastic polymer material, and as the tubes deformed the material at some levels of tightness, we can be certain that the softness was just right. Mechanical modeling allowed us to calculate the forces exerted by these cells. Lab-on-a-Chip (LOC) technology allows us to assess cellular behavior much better than the conventional Petri dish,” Packirisamy said. Sexual reproduction in plants is in many ways analogous to human biology. “In order to find its path to the ovule and the egg cell, the pollen tube has to invade a series of female tissues in the receptive flower,” Geitmann explained. “The male and the female organs continuously communicate during the process. The female aids the process by lubricating the path, but the male exerts significant force to overcome any residual resistance.” The pollen tube must penetrate through a central canal that connects the stigma, or pollen landing platform, to the ovary, the organ that houses the ovules. Upon reaching the ovary, it then passes onto the internal surface of the placenta, finds and enters the opening in the ovule, and finally bursts open when connecting with the egg cell, enabling its fertilization by one of the two sperm cells it delivers. The other sperm cell fertilizes another cell of the female gametophyte to give rise to a tissue that nourishes the growing embryo. How the timely discharge of the sperm cells is triggered in plants has essentially been unknown. The control of this process is crucial for successful fertilization and seed set, since plant sperm is not motile and must therefore be delivered precisely to its target. A precocious discharge (before the pollen tube reaches the ovule) will not allow the sperm cells to reach the egg, whereas on the other hand, a failure to discharge equally precludes fertilization. “Our findings show that a tight grip around the tube does result in sperm release. This illustrates that plant cells perceive and respond to mechanical stimuli,” Geitmann said. “However, the particularities of the cellular responses we observed suggest that other factors, such as protein-based signals, are likely to be in play.” The researchers believe that these particularities and the mechanisms that control pollen tube diameter and growth behavior warrant further research. “We’re still not sure exactly what causes the sperm cell release from the pollen tube in vivo, but a mechanical trigger might be part of the signaling mechanism,” Packirisamy said. Amir Sanati Nezhad, Mahsa Naghavi, Muthukumaran Packirisamy, Rama Bhat and Anja Geitmann published “Quantification of cellular penetrative forces using Lab-on-a-Chip technology and finite element modeling” in the Proceedings of the National Academy of Sciences. This study received funding from Fonds de recherche du Québec – Nature et Technologies. Mechanical modeling expertise was contributed by co-author Professor Rama Bhat, Concordia University. The University of Montreal is officially known as Université de Montréal. 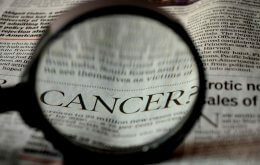 Dr. Geitmann is professor at the Department of Biological Sciences of the University of Montreal. She is plant cell biologist and studies plant development at the cellular level. Her research program combines cell biological approaches with high end imaging and theoretical modeling to understand the mechanisms that govern shape development in plant cells. Dr. Packirisamy is professor at the Department of Mechanical Engineering of Concordia University. His research is in the area of micro-electro-mechanical systems (MEMS), integrating micro-fluidics with micro-photonics and nano features. Holding the position of Concordia Research Chair on Optical-Bio Microsystems, he also leads research in the area of BioMEMS, an application of micro-nanotechnologies in biology. Investigators can grow, manipulate and characterize individual plant or animal cells in a Lab-on-a-Chip. In this study, Packirisamy worked with Geitmann to design a Lab-on-a-Chip in which the plant cell is forced to squeeze through tiny apertures made of material soft enough to measure the force of the growing cell. Controlling the growth and direction of the cell while also using surrounding structures as sensors makes it possible to estimate the pressure inside the cell. Lab-on-a-Chip technology has huge potential for cell sorting, cell (sperm/egg) selection, toxicology, pharmaceutical tests, study of mammalian cells and personalized medicine.